In 1917, as the United States prepared to enter World War I, the War Department requested the return of Fort Norfolk to its jurisdiction. The U.S. Army Corps of Engineers had sought to secure the use of the fort from the Navy in 1903 and again in 1915. By this time, Fort Norfolk served the Navy as "an auxiliary to the St. Julien's Creek Ammunition Depot," and the old magazine keeper's house (which had been expanded in 1893) served as the home of the Navy's Inspector of Ordnance. The Navy declined the War Department's requests. A naval official argued that the "stowage space at the [Fort Norfolk] reservation is absolutely necessary to this Department at the present time on account of the great congestion at the ammunition depot." The Navy allowed that there was no live ammunition stored there, but there was still "a considerable quantity of empty projectiles and non­ explosive ammunition details such as powder tanks, cartridge cases, etc. stowed in the magazines" (ROCE Correspondence 1884-1923, Daniels to Secy. of War, April 24, 1917). As noted above, the War Department had never relinquished ownership of the property when it was transferred to the Navy in 1849. However, the Navy resisted the War Department's efforts to reclaim the reservation. 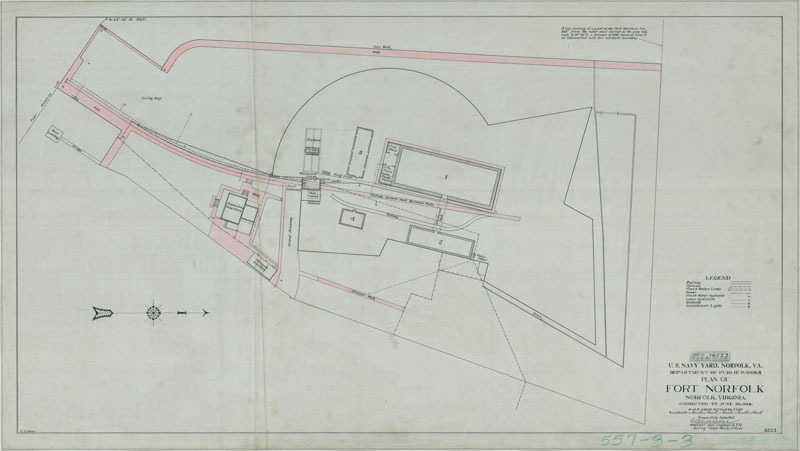 In 1918, the Navy's Department of Public Works produced a plan of the fort to show the existing sewer and water lines. In addition, the major buildings as well as the cistern and pump house were shown. There were now two sections of railroad track within the fort. A covered walkway connected the magazine and the old officers' quarters (Bureau of Yards and Docks 1918) (see above). By 1920, the U.S. Navy had tacitly agreed that Fort Norfolk would be returned to the War Department. In anticipation of the U.S. Engineers taking over the fort, a dredging and wharf building project was initiated on the northwest side of the property (U.S. Engineer Department 1920) (see below). 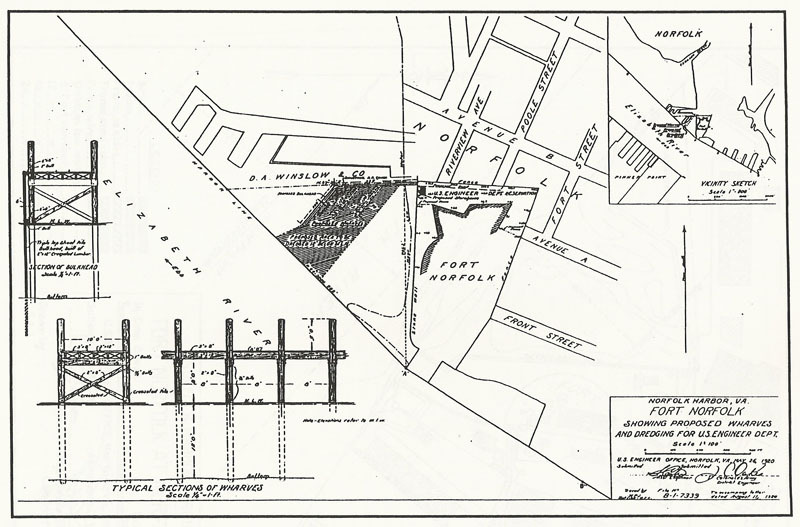 The "creosoted pile wharf" protected a small harbor for "landing small boats and the collecting spot for supplies to the river and harbor plants" (ROCE, Correspondence 1884-1923, Oakes to Chief of Engineers, October 21, 1921).